I'm getting ready to head out of town, so the writing part is a bit scattered this week. Spoiler Alert! 1 Kings is about a bunch of kings. King David dies. David's son Solomon takes the throne. 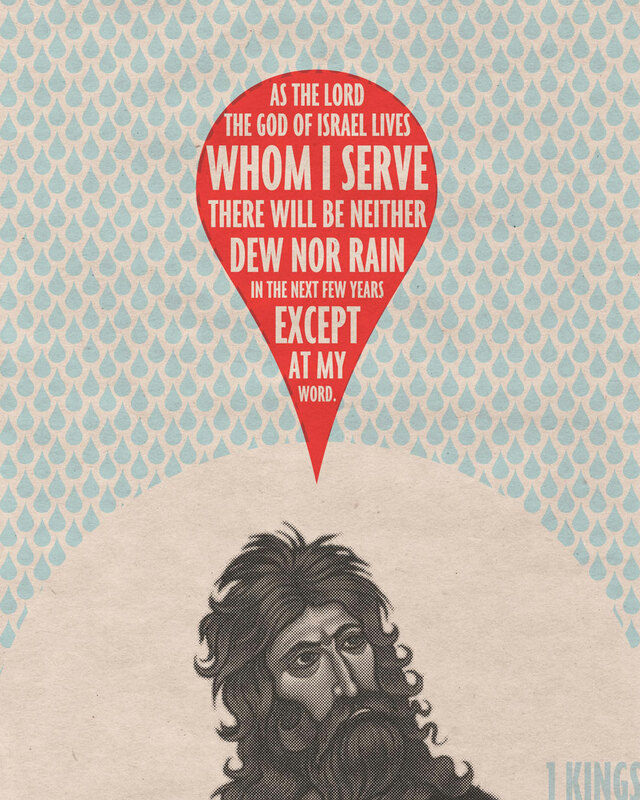 God is all Beastie Boys with King Solomon and is like "So what, so what, so whatcha want?" Solomon says, "I want to be wise." Solomon is very wise. He builds the temple. God is happy. He has 700 wives and 300 concubines. God? Not so happy. Then there's a bunch of other kings. As with apples, some are good, some are bad. Elijah is hungry, and God has ravens bring him food (true story). He does a bunch of miracles. The king worships a false god. Elijah is like, "yo king, what's up with that? Are you stupid or something? Don't you 'member what I did with the rain?!" The king is like, "I know you are but what am I?" They go back and forth until they decide on a good old fashioned God-off! The rules? Build an altar, throw some wood on it and whoever's god throws down flames is the winner. The king's prophets scream, dance and cut themselves (sorta like a Nine Inch Nails concert), but no flames. Elijah mocks them and suggests that maybe their god is on the toilet (true story). Elijah is like, "soak that altar." They douse it with water. Then he's like, "that's not enough. Soak it like it's that ride Flash Flood at Noah's Ark Water Park in Wisconsin Dells!" Then God lights it up like a Cuban cigar and burns the alter up. Elijah is like, "that's right suckas, God wins! You in the jungle baby, you gonna die!" and all the other prophets were killed (true story – my paraphrase). Elijah does a bunch of other cool stuff and gains an apprentice, Elisha (could their names be any more confusing?). More kings do more bad things. The end. My insights into 2 Kings will be deeper and less heretical. I promise.